Cartilage cancer. 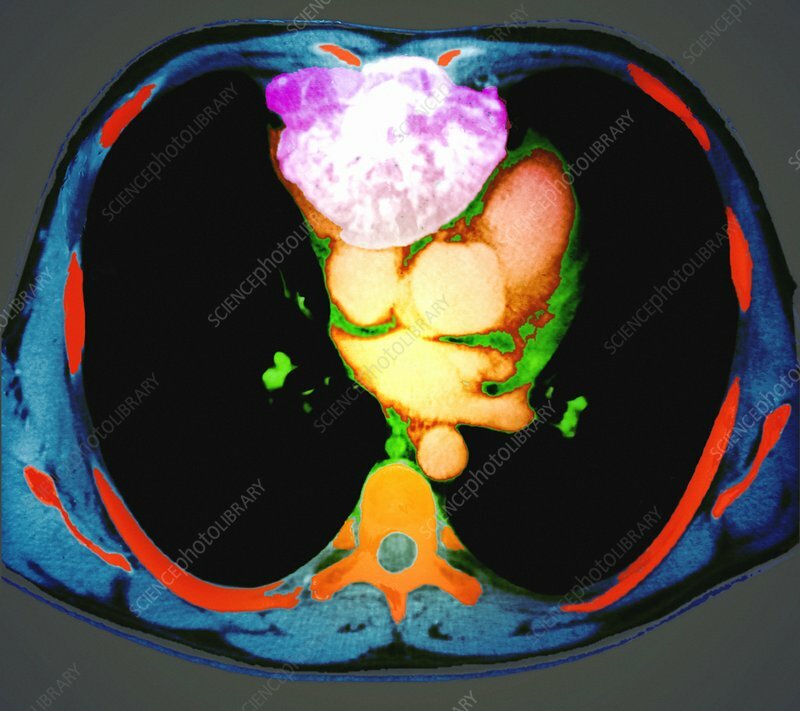 Coloured computed tomography (CT) scan showing an axial section through the chest of a patient with a cancer (purple/white, upper centre) on the breastbone (sternum). The front of the body is at top in this view from below. The cancer is of cartilage in bone, and is named a chrondrosarcoma. It is a large cancer, and is beginning to compress the heart and its blood vessels (yellow) in the mediastinal area between the lungs (black). As this type of cancer does not normally respond to chemotherapy or radiotherapy, treatment involves surgical removal. The spine is seen at lower centre. Medical CT scans use X-rays to construct slice images through the human body.